Get 12 issues for $10.91 ($0.91 per issue) from BestDealMagazines.com with coupon code "MPSSAVE16". *BEST VALUE* Get 24 issues for $19.31 ($0.80 per issue) from BestDealMagazines.com with coupon code "MPSSAVE16". 2 Other Stores We also checked the following 2 stores and they do not appear to sell Stereophile Magazine: College Subscription Services and SubscriptionAddiction.com. Click on the desired price/store/issues in the grid for details on subscribing to Stereophile Magazine. 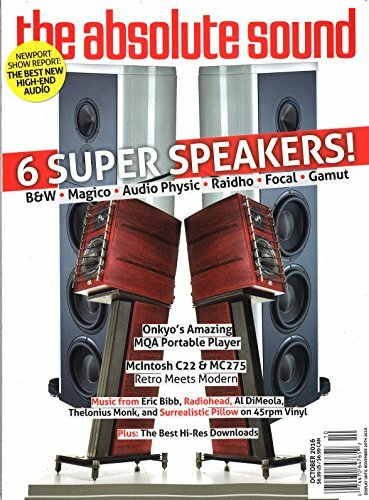 As the ultimate guide for high-performance audio components, STEREOPHILE contains in-depth reports on ""high-end"" loudspeakers, amplifiers, CD players, turntables and other audio components, examining how these products will sound in purchasers' homes. Detailed technical measurements are also performed using the magazine's state-of-the-art test equipment. As the ultimate guide for high-performance audio components, STEREOPHILE contains in-depth reports on 'high-end' loudspeakers, amplifiers, CD players, turntables and other audio components, examining how these products will sound in purchasers' homes. Detailed technical measurements are also performed using the magazine's state-of-the-art test equipment. Reviews high-end audio, stereo equipment. Stereophile is a high-end audio magazine devoted to testing high-performance audio components and how they sound in the listener's home. Each issue also features articles on audio and recorded music, interviews with audio engineers and musicians, news on the developments in sound reproduction, and scholarly and entertaining record reviews. Stereophile magazine is the oldest and largest U.S. publication dedicated to high-performance audio components. Each issue features reports and reviews on audio components, and advice on system installation and use in the home. If you`re a high-fidelity stereo perfectionist, Stereophile is for you. Whatever the medium via which audiophiles choose to enjoy their music -- be it two-channel or surround-sound, CD,SACD, DVD-A, MP3, LP or whatever -- you will be able to read and learn about how to get the best of it from Stereophile. Find the best price for Stereophile at MagazinePriceSearch.com!